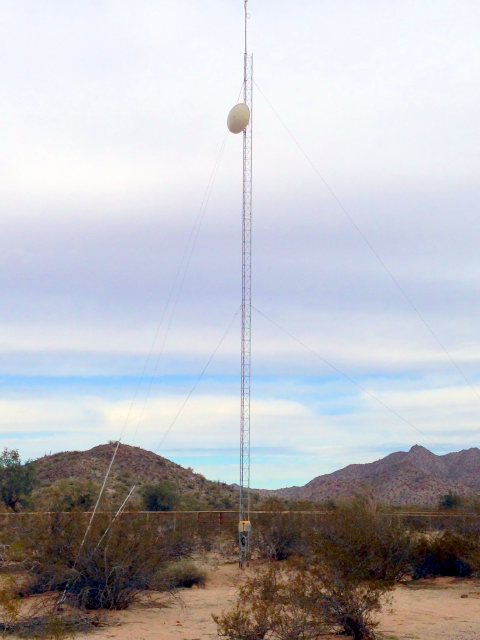 AireBeam builds light duty towers on private property throughout Southern Arizona with the consent of property owners. It is called the Site Host Program. Towers are usually 60′, 12″ face triangle lattice towers. They are held up by six (6) guy wires that radiate out 48′ from the center where the tower is placed, therefore requiring a piece of land that is about 100′ diameter. Frequently towers are placed on a far corner of a Site Host’s property, in which case two of the guy wires are placed on property lines on either side of the corner and only one guy wire sticks out into the Site Host’s property. A dedicated circuit breaker is installed in the Site Host’s power panel and a trench dug from there to the tower where a cabinet is located, either on the tower or adjacent to it, on two schedule 20 galvanized pipes that sunk into the ground in concrete-filled holes. The typical tower consumes about 25 watts of power, about the same as a 25 watt light bulb. As compensation for letting Airebeam place the tower on the his property, the Site host is provided with free Internet service at 10mbps and a an annual payment of $250 to cover electricity usage. If more equipment is required a the site and more electricity consumed, reimbursement is adjusted accordingly. Airebeam executes a simple “Site Host Agreement” with the property owner with a 5 year term that either party can cancel with six (6) month’s notice. You may download a copy of the standard agreement by Clicking Here. If you are interested in becoming a Site Host, call us at (520) 233-7400 and tell us your address. If you live in an area that is not easily found on Google Maps, locate your property on Google Maps, click on the “Link” button and paste the link into the email that you send . Airebeam will check coverage requirements and, if your property is in an area where a tower site is required, a representative will contact you and execute an agreement with you.